← 2013 Triangle Christmas Parades, Tree Lightings, & Holiday Concerts! Stop by Videri Chocolate in the Raleigh Warehouse District this Friday between 6-8pm for a cool coffee brewing demonstration using the innovative Impress Coffee brewer. There will be free samples (tastings). 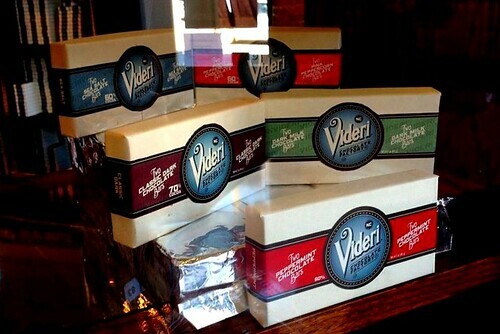 You can also take a self guided tour of there chocolate making operations at Videri. Bonus: Make sure you stop by the bottle shop Tasty Beverage next door while you are down that way. This Friday Sola plays host to musical guest Jo Gore. I’ve seen Jo and her partner Bo perform as an acoustic duo several times. They are a truly amazing duo and are not to be missed. Music by Jo Gore along with dinner at Sola makes for the perfect Friday evening date night. Get there early for the best seating! Music starts around 7:30pm. Yes it’s still November, but the Raleigh Christmas Parade is not to be missed. Fantastic Floats, music, and entertainers cruise through downtown to huge crowds. My favorite spot to watch is on Fayetteville Street near the capital building. Yeah Bag Pipers! Join the members of the Wake & District Public Safety Pipes and Drums as they celebrate yet another tremendous year together. This year the “Pipe-Band Pub-Night” will feature performances by members of Wake and District, the NCSU Pipe Band and My Three Kilts. It will be an evening full of piping, drumming, dancing, singing and meriment. They will have special edition FOR OUR FALLEN t-shirts, hats and mason-jar pint glasses available for sale. A $4 cover charge is being requested with proceeds for our fallen; there will be a toast to our fallen at 10:00 pm. Stop by North Hills this Saturday from 4-8pm for a day of Holiday activities. Vendor Village, Live Music, Train Rides, and Santa. The highlight of the night will be the lighting of the Christmas Tree. You may even see me out there playing my trombone! Housing for New Hope’s Inaugural Rent Party will gather the community together for a night of live music and the city’s best culinary creations to raise funds to help families and individuals move from homelessness to home. All funds raised will help support security deposits, rent, utility deposits and associated costs of establishing sustainable housing for the homeless. The biggest weekly swing dance party in the Triangle. Celebrating 8 years of great Lindy, West Coast Swing and Slow Blues dancing. You can expect lots of friendly dancers who are supportive and welcoming to first time attendees. Cash bar, great air conditioning, set in a comfortable, smoke free atmosphere. No partner is necessary – all welcome. Falling somewhere between the categories of melodrama, radio play and opera, All Souls is a setting of nine excerpts from the novel All Souls Day. It will be performed by the New Music Raleigh chamber orchestra under conductor Timothy Myers and featuring Canadian vocalist Ashleigh Semkiw. Seating in this venue is limited, so get your tickets today! Tickets are $25 and can be purchased online or over the phone at 919.792.3850. Performance is Monday, November 25 at 7:30 pm. CAM Raleigh @ 409 W. Martin Street, Raleigh, NC 27601.